This week’s moon is waxing gibbous: it will be 13 days old on Friday, September 9, 2011. This story was updated at 9:58 p.m. ET. Over the next few nights, the earth's moon will be well placed for observation as it moves towards full moon on Sunday night (Sept. 12). This month's full moon is special, because it is the Harvest Moon in the Northern Hemisphere. Because of the location of the sun, Earth, and moon this month, the nearly full moon will appear low in the southeastern sky for several nights in a row, which traditionally has allowed farmers an extension of daylight during the critical time of year when they are harvesting their crops. The exact time of full moon will be 5:27 a.m. EDT (0927 GMT) on Sept. 12. Currently, the moon is in its waxing gibbous phase and not yet completely full. This sky map of the September's waxing gibbous moon shows how it will appear to skywatchers at mid-northern latitudes this week. Most people know what "crescent" means but are puzzled by "gibbous." It comes from an old Latin word gibbus meaning "hump," and refers to the hump shape that the moon assumes during this phase. Some people may take the moon for granted, but it is worthy of a lot more attention from skygazers. Take a careful look over the next few nights and you'll be surprised at how much detail you can see on the moon with your unaided eye. In fact, you can see more detail on the moon with your naked eye, than can be seen on Mars with the finest telescopes on Earth. Use an ordinary binocular or small telescope and you’ll be able to see a number of the famous craters on the moon. These are named for the great astronomers of the past; only the craters named for the Apollo astronauts honor living people. Look towards the northern edge of the moon for the dark-floored crater Plato, 63 miles (101 km) in diameter, and toward the southern edge for the brilliant Tycho 53 miles (85 km) in diameter. Plato is close to the arcing "shoreline" of the Sinus Iridum, the "Bay of Rainbows." The ancient astronomers who named the plains of the moon "seas" and "bays" had no idea that it was an airless, waterless wilderness. Tycho is one of the youngest craters on the moon, a mere 100 million years old, and is the origin of a complex system of rays stretching half way around the moon. With these as your guides, look more closely for the gigantic walled plain of Gassendi 68 miles (110 km) in diameter on the northern "shore" of the Mare Humorum, perfectly lit by the rising sun on Thursday night (Sept. 8). Observers with telescopes can see the complex system of rilles which crisscross its floor. On the moon, a "rille" is a crack in the surface where overlying material has collapsed. 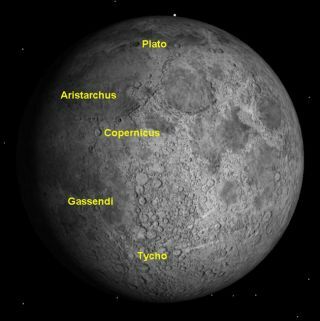 The sun will rise over the Aristarchus, which is small in diameter (about 25 miles or 40 km), but is the brightest area on the whole moon, on Friday night (Sept. 9). Associated with Aristarchus is a huge mountain massif broken up by a winding valley, the Vallis Schröteri. Aristarchus is another fairly "young" crater, only 450 million years old and, like Tycho, is the origin of a complex ray system. It’s interesting to use Wikipedia to explore the lives of the astronomers who have had craters named after them. Some, like Nicolas Copernicus and Tycho Brahe, are well known; others, like Pierre Gassendi, less so. Then, for the next few nights, simply kick back and enjoy the beauty of the harvest moon, rising evening after evening in the east, and filling the late summer evenings with golden light. This story was updated to correct the timing of September's Harvest Full Moon, which occurs at 5:27 a.m. ET on Monday, Sept. 12.